U.S. AIR FORCE ACADEMY, Colo. — The Air Force Academy honored Capt. Mark Weber, a 2011 graduate killed in a helicopter crash while serving in Iraq, on the one-year anniversary of his death with a memorial and dedication ceremony March 15. 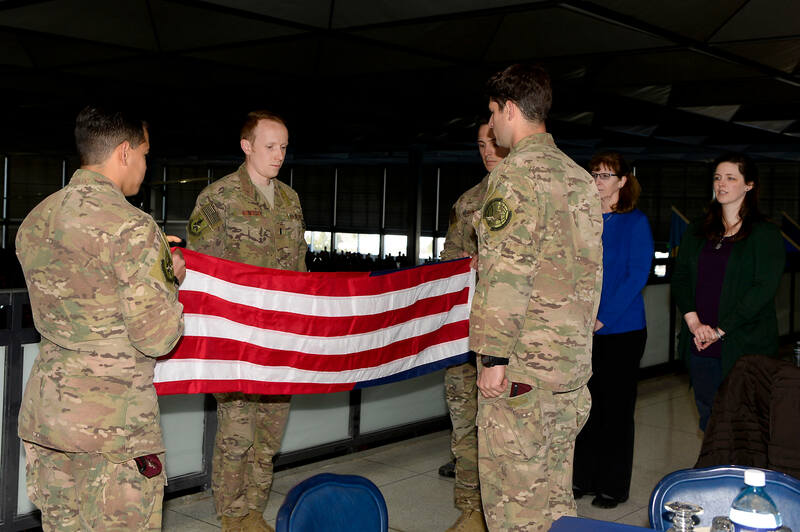 “His sacrifice represents the truest form of selflessness a service member could have,” said Cadet 3rd Class Riley Holt the lead ceremony organizer. Weber, formerly of Cadet Squadron 12, began his Air Force career as a contracting officer but later became a combat search and rescue officer. Holt said the decision reflected who he was as a person – someone who would risk his life to help others. “His legacy of being a caring friend and a courageous leader is one that I am striving to embody myself,” Holt said. The squadron found printed e-mail correspondence that showed Weber was a squadron academic officer during his senior year. Holt said it felt right to dedicate their squadron academic room to Weber, who she described as passionate about helping others learn. “Honoring his life, sacrifice and legacy is the right thing to do. It shows how much we care for him as a fellow brother-in-arms, as well as for his family, friends, and former squadron mates,” Hold said. Weber is survived by his parents Ron and Marge Weber, and four sisters, Leah, Katherine, Lori and Kristen Weber.